Participants will experience a fitness program that is both beneficial and fun. Provide each participate with either a Group Size: Small to 24” or 36”Toobeez. Group Size: Small to large group. Orient the participants to each other and open with a brief discussion on the benefits of maintaining physical activity as we age. 2. When the group is ready to begin the activity, share the following storyline. 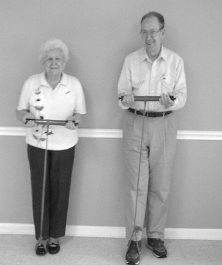 There is a rumor going around that seniors are incapable of participating in any kind of a hysical workout program. It is also being said that seniors can not have fun and do not benefit from being active. Your group must dispel this myth. Are you up to it? Activity Challenge: Participants will experience a fitness program that is both beneficial and fun. 4. Have participants stand or sit in rows with the therapist or activity professional in the front of the room with his/her back to the participants. 5. Before beginning the Beez Fit workout, have participants warm up with the following exercises. Have the participants complete ten head rolls and ten shoulder shrugs. Conduct additional stretches as you see necessary. 6. Provide each participant with a Toobeez tube. The therapist or activity professional should also have a tube. 7. You can develop your own routine, but a workout might include some of the following exercises. Have participants repeat each selected exercise six times. Have the participants hold the Toobeez tube over their heads with their handswide apart on the tube. Then, have the participants extend the tube behind their backs and then move the tube forward again. Hold hands apart on the tube and lean to both the left and right sides. Have the participants extend the Toobeez tube straight out in front of them andraise one leg to touch the Toobeez. Have the participants hold this pose for five seconds. Complete two sets of six for each leg. Therapist Note: Participants may need to hold on to the back of a chair for balance. 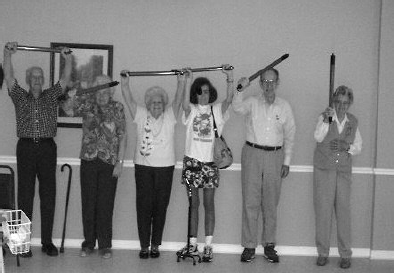 While standing, have the participants place the Toobeez tube behind their knee.Have the participants raise their leg while holding the Toobeez in place as if marching. Hold the Toobeez in place for the count of ten, and complete two sets of six for each leg. While sitting in chairs, have the participants extend both their legs. Placethe Toobeez on top of their ankles. Have the participants hold this position for 20 seconds. Complete two sets of six. 8. Movements are endless. Toobeez can be incorporated into an existing exercise program or can be added as a new program, “Beez Fit,” which focuses on flexibility and endurance. A faster pace with livelier music may make this one of your most popular programs. 9. If your group is struggling, or if you feel your group would benefit from an additional challenge, present a variation provided below. 10. After the activity, move to the “Activity Discussion and Processing” section. 1. Use the shorter Toobeez. Develop routines working with the shorter Toobeez in pairs. In doing so, you are able to accommodate a much larger group. 2. Develop a chair exercise program. Have the participants complete the same exercises, but have them seated in a chair. Participants could also hold the back of the chair for safety. Have the participants complete the same exercises, but have them seated in a chair. Participants could also hold the back of the chair for safety. 3. Develop a rhythm routine. Work out to a song. Tap the Toobeez on the floor or hit each others’ Toobeez to develop a rhythm performance. 4. Attach a Theraband to Toobeez. Tie a Theraband to the middle of the Toobeez and make a loop in the other end and wrap it around the shoe (as pictured at right). Do arm curls with the Toobeez. Make sure there is plenty of room between participants so they do not swing and hit one another with a Toobeez tube. Music from the participant’s era can be added for a more pleasurable experience. How did you feel when you heard we were going to exercise? How does working on strength and flexibility help you? What are the benefits of staying active? Is it ever too late to start a fitness program? What are some goals you might try to increase your activity level? Review the challenge of the group and summarize how the challenge was (or was not) achieved. Highlight the main contributions and resolve unfinished issues. Affirm their efforts for support and acceptance of each other’s feelings.